They're a great shop to work with. They were polite, experienced and informative. They even gave me a loaner car for the day, while they worked on my RV. It was well worth the hour drive north to have them work on my RV. I highly recommend Stadium Automotive for your automotive needs! You can schedule a meeting with us online, using our appointments form. Stadium Automotive in Eugene, OR primarily focuses on the quality service and efficient repair of domestic cars and trucks. Stadium Automotive in Eugene, OR primarily focuses on the quality service and efficient repair of domestic cars and trucks. We are ASE certified mechanics with a focus on top-notch service, affordable prices, ethical business practices, and environmental concern. Stadium Automotive is a Authorized Bosch Service Center. 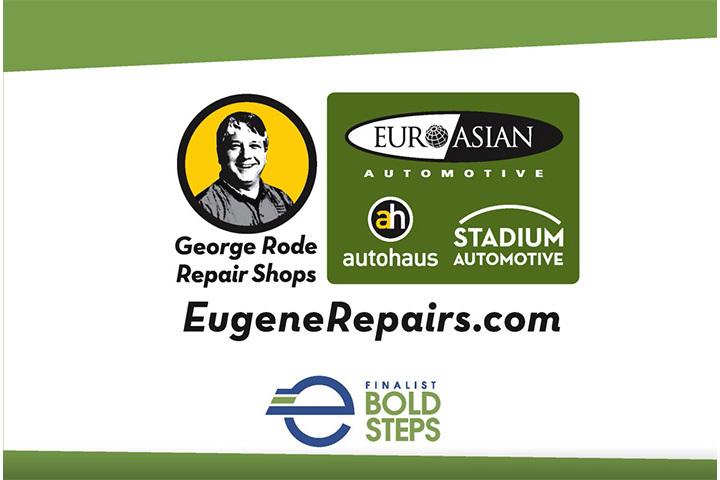 Located “two trees down from” Matthew Knight Arena, and just a block from Euro-Asian Automotive, our new “George Rode Repair Shop” serves all makes and models of American made automobiles. Stadium Automotive is a complete automobile service center. Our experienced, certified technicians specialize in full-service repair and our fully equipped, environmentally-friendly repair center features the absolute latest in diagnostic technology and calibration equipment available today. The Shop Owner George Rode Drives a Ferrari. George always wanted to drive a Ferrari fast, but could never afford it. He joined his first employee David Shaw, in Las Vegas and they decided to give it a try and see how it felt to drive these luxury vehicles.